Cell culture has been dubbed as the integral ‘work-horse’ for any biopharmaceutical manufacturing process. With an integral role in the cultivation of artificial organs, for the development of cells to test antibiotics against, and for research purposes that delve deep into the understanding of the effect of disease causing organisms within the human body, the cell culture market is consistently growing as a result of the expanding healthcare market. Recent trends with regard to extensive government support through funding for the promotion of regenerative medicine in the region is significantly propelling the market. Also, owing to ensuing increase in disposable income in major countries such as Brazil and Mexico, the regional cell culture market is witnessing a massive influx of technological trends that have already become routine in the global cell culture market. With the Latin America region posing as one of the lesser-developed regions with respect to the medical advancements that have become routine in other parts of the world, there is immense potential for growth of the Latin America cell culture market. The purpose of the study is to gain a holistic view of Latin America cell culture market in terms of various factors, including regulatory reforms and technological advancements, which are influencing the market. The market has been segmented into ‘product’, ‘end user’, and ‘country’. The scope of this report is centered upon conducting a detailed study of the products allied with the Latin America cell culture market. 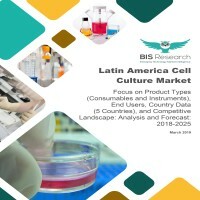 In addition, the study also includes the exhaustive information on the unmet needs, perception on the new products, competitive landscape, market share of leading manufacturers, growth potential of companies, as well as other vital information with respect to Latin America cell culture market. The report presents the reader with an opportunity to unlock comprehensive insights with respect to the market and helps in forming well-informed strategic decisions. The research uncovers some of the substantial parameters that must be taken into consideration before entering into the market. This research report aims at answering various aspects of the Latin America cell culture market with the help of the key factors driving the market, the restraints, and the current growth opportunities that are going to shape the future trajectory of the market expansion. The report includes an in-depth examination of the key players and recent developments taking place in this market. Moreover, the report includes chapters on market dynamics (market drivers, opportunities, and challenges) and industry analysis as well. The research study highlights the factors governing the industry attractiveness with Porter’s Five Forces for a comprehensive understanding of the Latin America cell culture market. Moreover, the study includes detailed product mapping, market estimation, and analysis of key trends in multiple countries, growth of Latin America cell culture market in each country, and the key strategies and developments by the prominent manufacturers. • What are the major market drivers, challenges, and opportunities in the Latin America cell culture market? • What are the underlying structures resulting in the emerging trends within the Latin America cell culture market? • How will each segment of the Latin America cell culture market grow during the forecast period and what will be the revenue generated by each of the segments by the end of 2025? • What are the key regulatory implications in developed and developing regions for the Latin America cell culture market? • Who are the leading players with significant offerings to the Latin America cell culture market? What is the current market dominance for each of these leading players? • What would be the compound growth rate witnessed by the leading players in the market during the forecast period 2018-2025? Which cell culture product type is having the most promising growth? • Who are the primary end users in the Latin America cell culture market? Which is the fastest growing end-use segment in the Latin America cell culture market? • Who are the key manufacturers in the Latin America cell culture market, and what are their contributions? Also, what is the growth potential of each major cell culture products manufacturer? • What is the scope of the Latin America cell culture market in Brazil, Argentina, Mexico, Chile, and Colombia? The key manufacturers who have been contributing significantly to the global industrial microbiological QC market include Becton, Dickinson and Company, CellGenix GmbH, Corning Incorporated, Eppendorf AG, Fujifilm Holdings Corporation, General Electric Company, Lonza Group AG, Merck KGaA, Sartorius AG, and Thermo Fisher Scientific Inc., among others. 7.11 Thermo Fisher Scientific Inc. Although a mature market, the cell culture market is consistently witnessing significant evolution in the technological developments it has given rise to. With respect to organ transplantation and study of the disease mechanism in human, the concept of 3D cell culture has defined the current era. This type of cell culture not only allows for better visualization of the environment within the human body, but there is also the aspect of realizing the instantaneous effects of a wide variety of agents in real-time. Another largely undermined factor for the rising global disease burden is antimicrobial resistance (AMR). Largely a natural phenomenon, antimicrobial resistance is triggered by the excess usage of antibiotics for treatment of diseases with microbial origins. A complex issue of global concern, AMR is majorly driven by human action and perverse incentives. AMR has been synonymous with the promotion of drug discovery and novel molecule discovery. The predominant aspect of cell culture is the integral for any biopharmaceutical manufacturing process. Also, cell culture plays an integral role in the cultivation of artificial organs, for the development of cells to test antibiotics against, and for research purposes that delve deep into the understanding of the effect of disease causing organisms within the human body. With the Latin America region posing as one of the lesser-developed regions with respect to the medical advancements that have become routine in other parts of the world, there is immense potential for growth of the Latin America cell culture market. The purpose of the study is to gain a holistic view of the Latin America cell culture market in terms of various factors, such as recent trends and product advancements, influencing the market. The scope of this report is centered upon conducting a detailed study of the products allied with the Latin America cell culture market, broadly classified as consumables and instruments. However, the market estimation only comprises manufacturers of these products. The Latin America cell culture market is segmented into three different segments namely product, end user, and country. These segments are further segmented into several sub-segments to ease the market estimation and to gain a holistic view of the market. The overall market value was estimated using different approaches and validated with each other. Based on countries, the Latin America cell culture market is segmented into Brazil, Mexico, Argentina, Chile, and Colombia, which have been studied and documented in detail to understand the various factors that are consistently responsible for shaping up the market. The key manufacturers who have been contributing significantly to the Latin America cell culture market include Becton, Dickinson and Company, CellGenix GmbH, Corning Incorporated, Eppendorf AG, Fujifilm Holdings Corporation, General Electric Company, Lonza Group AG, Merck KGaA, Sartorius AG, and Thermo Fisher Scientific Inc., among others.